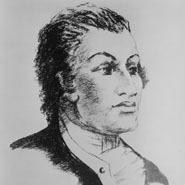 Haym Salomon was born in Poland and immigrated to New York during the 1770s. He brokered many large financial transactions that kept American soldiers clothed and armed during the Revolutionary War, playing a vital role in the American colonies' fight for independence. A prominent and financially generous member of the Philadelphia Jewish community, Salomon participated in the successful effort to remove the religious test oath required for holding public office in Pennsylvania. In 1784, he responded to antisemitic slander in the press by stating, "I am a Jew; it is my own nation...I do not despair...that we shall obtain every other privilege that we aspire to enjoy along with our fellow-citizens." Despite his contributions to the war efforts, Salomon died deeply in debt.